Georges Bordage, MD, MSc, PhD, professor of Medical Education at the University of Illinois at Chicago, spoke about the theory of diagnostic reasoning to Feinberg faculty, students and staff. Feinberg medical educators, trainees and students gathered recently to expand their knowledge of bedside diagnostic reasoning, and learned about ways to improve the training of medical residents in the process of reaching a diagnosis while observing a patient. 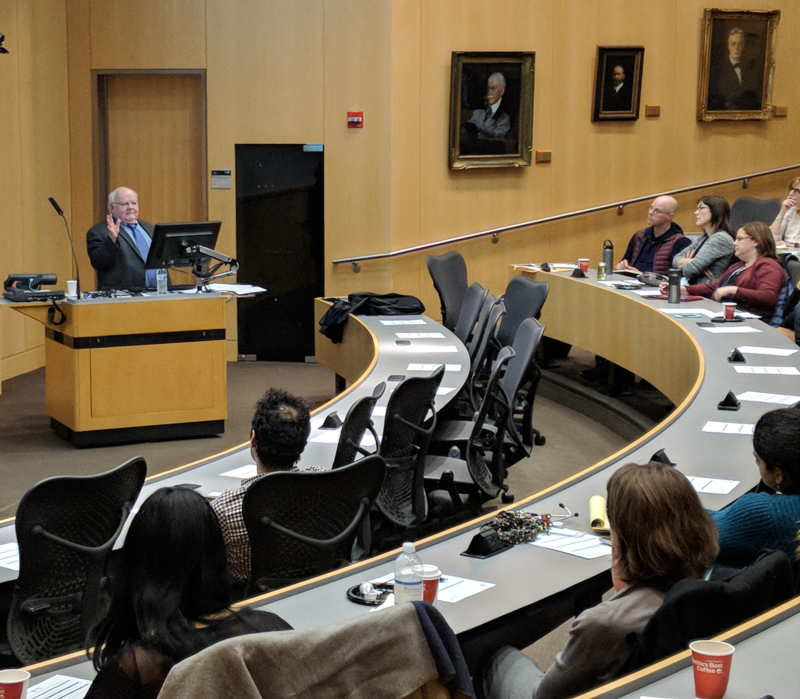 Georges Bordage, MD, MSc, PhD, professor of Medical Education at the University of Illinois at Chicago, spoke about the theory of bedside diagnostic reasoning at the final Today’s Innovations in Medical Education (TIME) lecture of 2017. TIME is a monthly lecture series at Feinberg dedicated to highlighting technological advances, new pedagogy and best practices in health education. The talk was sponsored by the Feinberg Academy of Medical Educators (FAME). Bordage was introduced by Walter Eppich, MD, MEd, associate professor of Pediatrics in the Division of Emergency Medicine and of Medical Education, who is also the director of FAME. In his hour-long talk, Bordage outlined the foundational concepts of diagnostic reasoning, including what to look for and how to elicit information from patients. Importantly, Bordage divides diagnostic reasoning into analytical and non-analytical processes. Bordage also focused on how to teach these concepts to trainees. A resident’s first impression is a useful indicator of their progress, Bordage said, but it needs to be balanced with careful analysis, as studies have shown an inverse relationship between time-to-diagnosis and diagnostic accuracy. “In other words, the quicker you come up with a diagnosis, the more likely it is to be incorrect,” he said. Instead, synthesizing the analytical and non-analytical approaches can result in an increase in diagnostic accuracy of over 30 percent, according to a study cited by Bordage. In addition, all trainee education can benefit from an emphasis on active learning, Bordage said. The next TIME lecture, “Collecting, managing and studying longitudinal qualitative text and narrative data,” will be delivered by Richard McGee, Jr, PhD, associate dean for Faculty Recruitment & Professional Development and professor of Medical Education, at 4 p.m. on January 16 in Baldwin Auditorium at the Robert H. Lurie Medical Research Center. In future lectures, Rimas Lukas, MD, associate professor of Neurology in the Division of Neuro-Oncology, will be speaking in February, and Mark Adler, MD, professor of Pediatrics in the Division of Emergency Medicine and of Medical Education with Mary McBride, MD, MEd, assistant professor of Pediatrics in the Division of Cardiology and of Medical Education will be speaking in March.